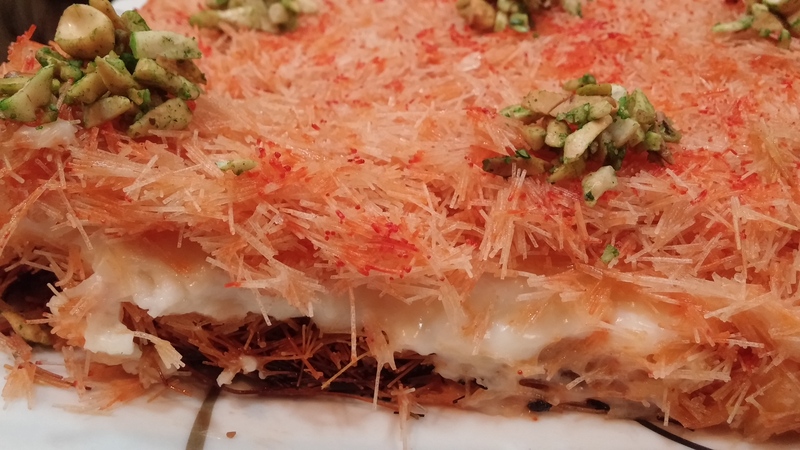 Kunafa also known as Kanafeh like most desserts has many variations. 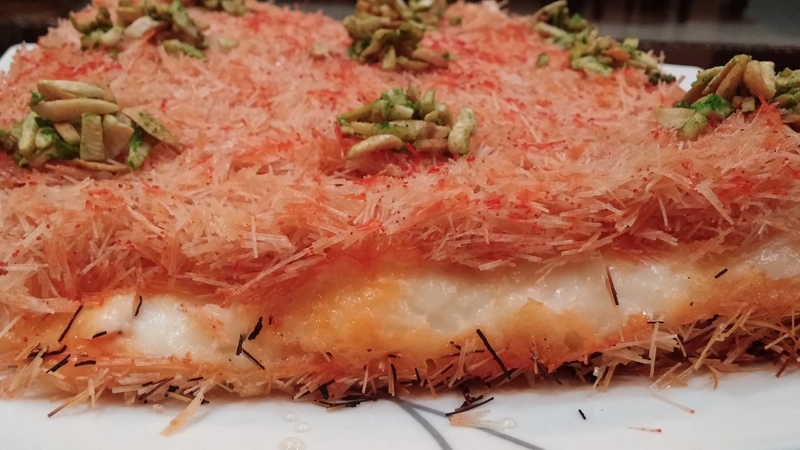 It is generally made with kataifi shredded dough and stuffed with Nabulsi cheese/ mozzarella and ricotta or cream cheese, walnuts and topped with crushed pistachios and sugar syrup.Another variation is to make it with semolina dough. 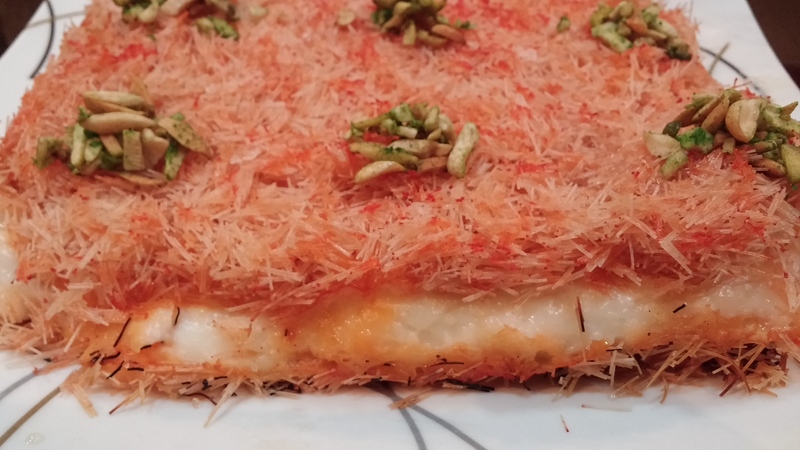 I wanted to make Kunafa at home but my husband wanted me to cut down on the calories. 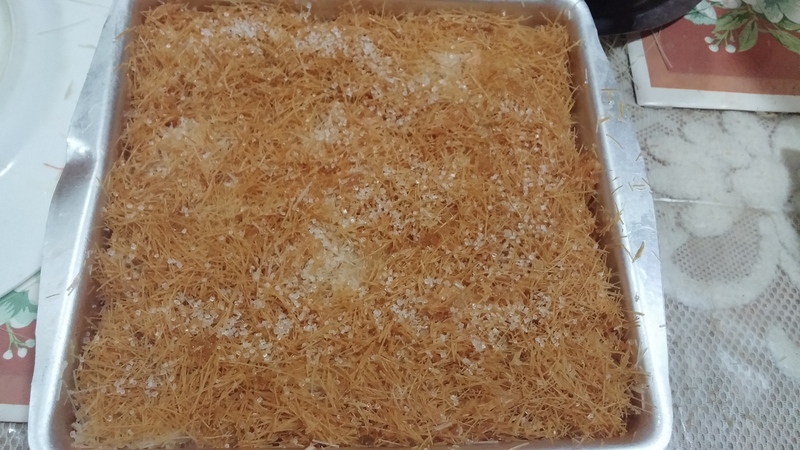 So I came up with this version of Kunafa, which was equally tasty. Crunchy crust and softly delicious inside. 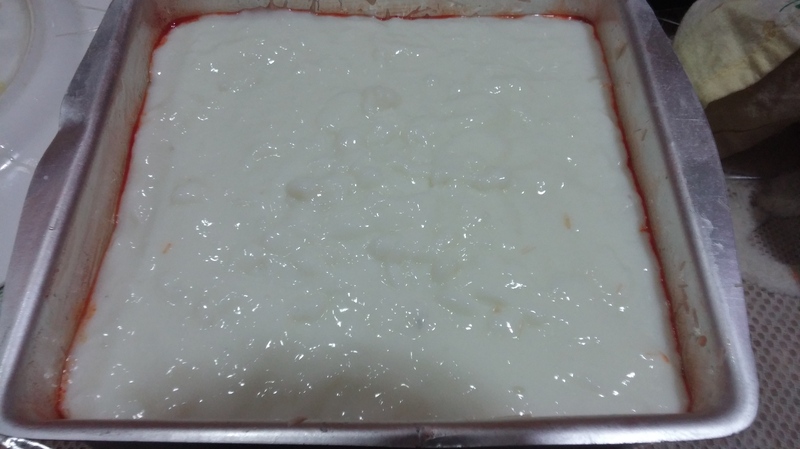 Plus, it is very easy to make.You can experiment with the fillings. 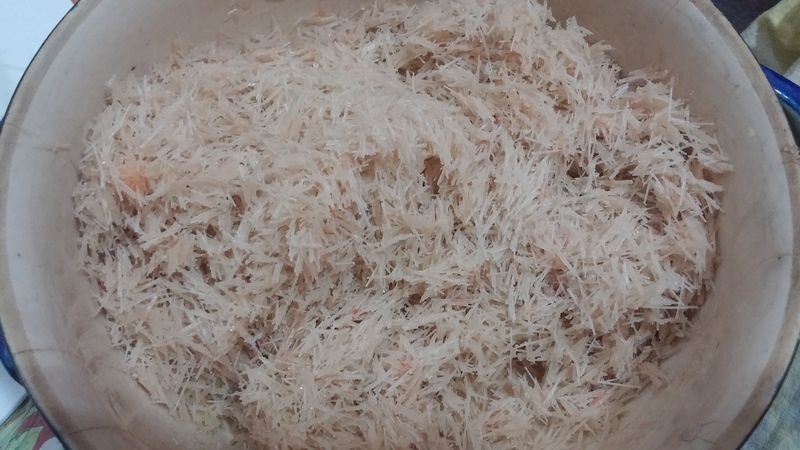 Take a large bowl and gently loosen the kataifi. Pour in the butter and mix well.Sprinkle sugar and the cinnamon and mix again. Keep aside. Heat milk and sugar in a thick bottomed pan/vessel. 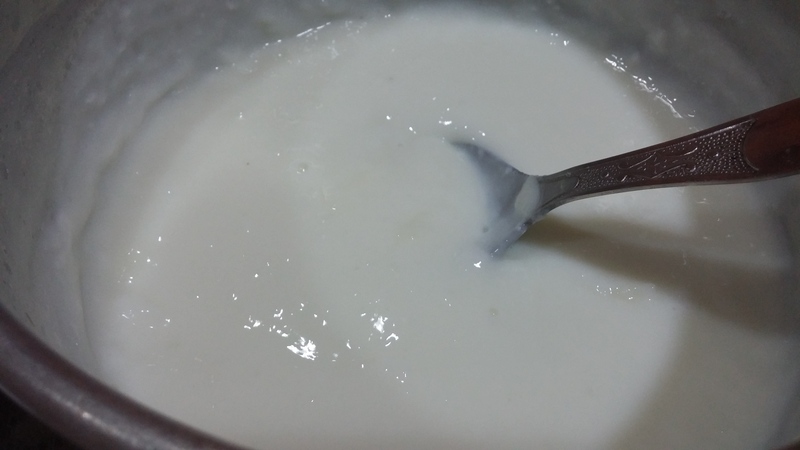 Gently add diluted corn starch to the milk and stir. make sure there are no lumps. When the milk becomes thick take off heat and add rose water or orange blossom water. Here, you can experiment with the filling. You can add cream or some condensed milk to make it richer. Alternative filling:You can crumble ricotta cheese (750 g)or you can use half and half of mozzarella and ricotta. Make sugar syrup with 1 cup of water and 1 1/2 cup of sugar along with lemon juice. Bring to boil, and simmer for 15 to 20 minutes until it forms a syrupy consistency. Take off heat and leave it to cool.Add a tsp. of Rose water. Preheat the oven to 350º F or 180º C .
Take a 12 inch cake pan. Add some orange food color to a tablespoon butter and grease the pan well. 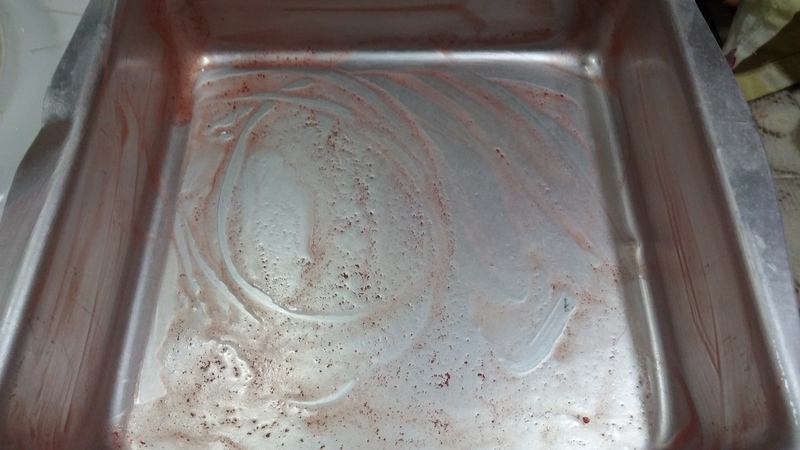 I suggest you use a spring form pan if available, because it will be easy to unmold. 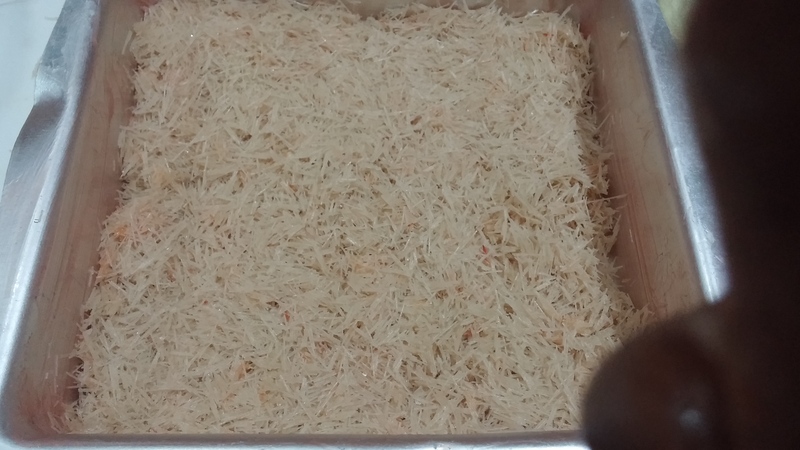 Spread half of the kunafa pastry on the pan and press well. Spread the filling gently over it. Bake for 30-40 minutes till golden in color. Take out of the oven and pour the sugar syrup while still hot. Let it cool. Invert it on a serving plate. Decorate with chopped nuts or pistachios. If you have made this dessert in advance, warm it up in the microwave before serving. I have to add, that I was inspired by my blogger friend Raya Najjar who posted the Cheese Kunafa recipe. 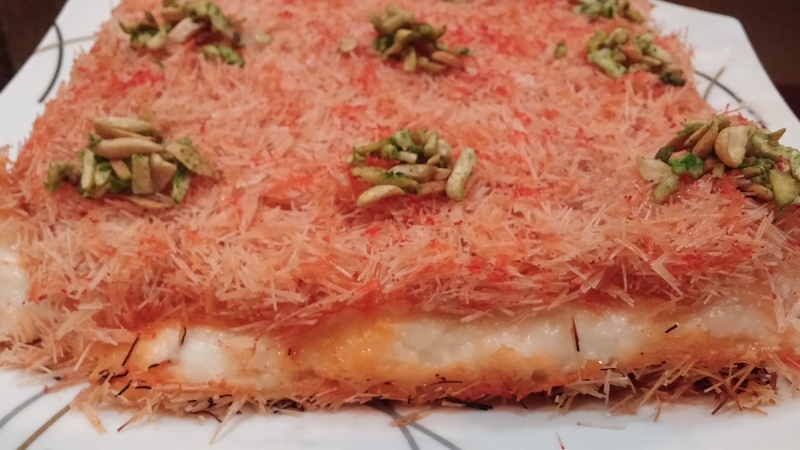 My recipe is different from hers but she inspired and encouraged me to try making Kunafa. Next Post Chinese biryani ? Wow a low calorie Kunafa! didn’t know that could be done, can’t wait to try it. Thank you for the nice words 🙂 You made my day!!! This is my favorite dessert! Thanks for posting it! Most welcome Sandhya 🙂 Thank you for liking it. Thank you Simi 🙂 tastes delicious too.. This recipe is fascinating to me. Did you use a springform pan? I have no idea where I would find Kataifi here in the states. Thank you so much for your kind comment 🙂 . I did not use a spring form pan. I used the regular one. I realised at the time of unmolding that a springform pan would have been a lot easier . You can make your own: Use thawed phyllo dough. 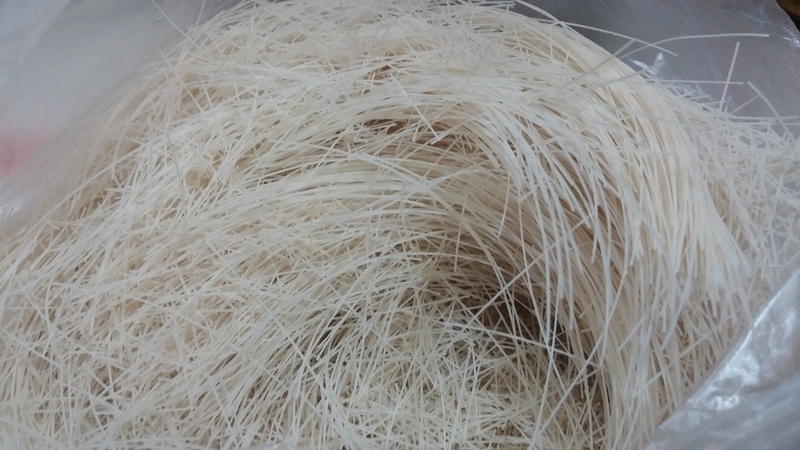 Roll into a log and using a sharp knife cut 1/8″ strips (will be thicker than kataifi. Great job! I didn’t know the fillings can be substituted c: I’ll try this next time inshaallah! Thanks for the mention! Thanks Linda 🙂 You are so familiar with the original version. So a compliment coming from you made my day. Kanafa reminds me of the lebanese restaurants in dearborn. thanks for sharing 🙂 I’d love to make it sometime. Most welcome 🙂 Thank you for the nice words.. Thanks Nell 🙂 It was delicious too..
Wow, I love learning new desserts and this one looks so yum!! Thank you 🙂 It is an easy to make dessert . I must try this dessert. It looks so good! Thank you 🙂 Is this Lubna ?? ?